The very finest example of feminized Skunk #1 and Sensi Seeds has it. Unashamedly uniform, Skunk #1 grows with both consistency and quality each and every time. Putting on an energetic performance, the Indica-dominant diva flaunts a tantalizing aroma and boasts amazing yields. Once inhaled, she puts hybrid genetics to good use, unleashing a physical/cerebral buzz that Indica lovers will adore. Skunk #1 feminized by Sensi Seeds is the feminized successor of a legendary strain that doesn't need much of an introduction. Skunk #1 sets the standard for powerful cannabis everywhere and is still the favorite for many smokers as well as growers. 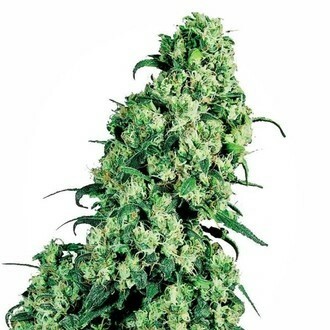 This feminized version emerges as a fast flowering specimen, that needs only 45-50 days of flowering to produce an amazing yield of large and dense nuggets. Split at a 65% Indica to a 35% Sativa ratio, Skunk #1 samples the very best of both worlds. This in turn enables her to put on a reliable and consistent performance - producing bountiful yields as a result. But how does she support such abundant yields? Well, as Skunk #1 develops, robust stems and branches start to emerge; keeping her fully anchored down and strong. Average in height but extra average when it comes to yields and effects, Skunk #1 is a stunning hybrid that would make any grower proud. Aesthetically pleasing, she grows mostly-Indica in appearance, all the while emitting a heavenly scent that always manages to turns heads. Although with that being said, her Sativa genes do play a part in regards to her floral structure and (of course) her high. Skunk #1 by Sensi Seeds rewards the grower with a smoke that will not disappoint. She lives up to her ancestors’ reputation and delivers a pleasant and potent mix of a physical stone and a mental high! Just how we like it! fast growing strong plants, thanks to zamnesia for excellent products and direct service !!! Alle gekeimt, schnelle Entwicklung, guter Strain bisher und keine Probleme gehabt. 2/3 ont poussées (mais Zam' a joué le jeu), elles poussent d'enfer ! Facile à cultiver, goût agréable, elle pousse très rapidement, c'est la plante idéale! Hammer 100% gekeimt... klasse sorte sehr zu empfehlen...! !